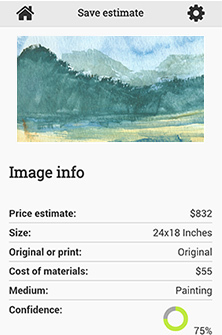 Estimate the price of your art quickly, easily, and from anywhere. Have an iOS/Mac device? You can use the free web app version by clicking the button above. Also available for Kindle Fire. Thousands of real-world examples of art pricing data from the Foundmyself art community are analyzed to give you an average price point, based on the specifics of your art. 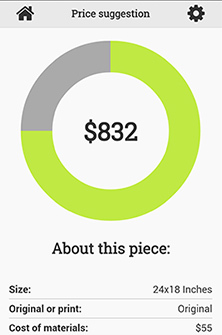 Your art's suggested price is returned quickly, and is based on the most up-to-date real-world art pricing information. You can save your estimates on your device and attach an image of your art if you have one. In this way you can track the estimates and compare them to your actual sales. Our app works with or without an internet connection, so you can get a pricing estimate wherever you are. The best results come when you do have internet, though, since our servers keep the newest sales data from which to pull.